Connect the Dots Ginger | Becky Allen: Friday's 5: What NOT To Do For A Race! Hey, hey everyone! Today is my first time doing a Friday 5. 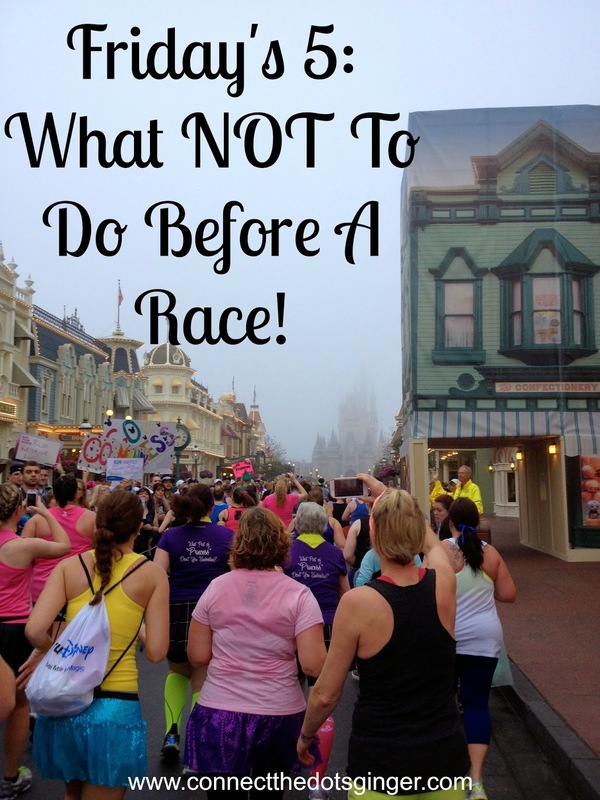 So here are 5 things on what NOT to do for a race! SERIOUSLY Learn from me. Now this post is for everyone. If you have never run in a race, READ IT and if you have run in a race before, go ahead and laugh at what I learned because chances are you have experienced these before! Just saying'! 1. DO NOT forget to apply BODY GLIDE to anywhere that rubs. That means under clothing seams at the waist, under the sports bra, between your thighs and your feet. Rubbing causes friction. Which will cause blisters or chaffing. It is not fun trying to finish a race with a massive blister on the verge of bursting, or has already burst or major chafing going on. IT HURTS! 2. DO NOT shave your inner thighs or higher, you know what I am talking about, the night before a race or the morning of the race! I REPEAT! DO NOT SHAVE! Just don't even shave. Make it a plan that you will shave a couple of days before. Here is why. FRICTION plus razor burn! Worse than just chaffing. The morning of my 1/2 marathon I made this mistake. I shaved my upper thighs, not that they needed it but I thought it would be more "slippery" when I applied my body glide and be better. IT WAS WORSE And it hurt and I dealt with the chaffing for days afterwards. 3. 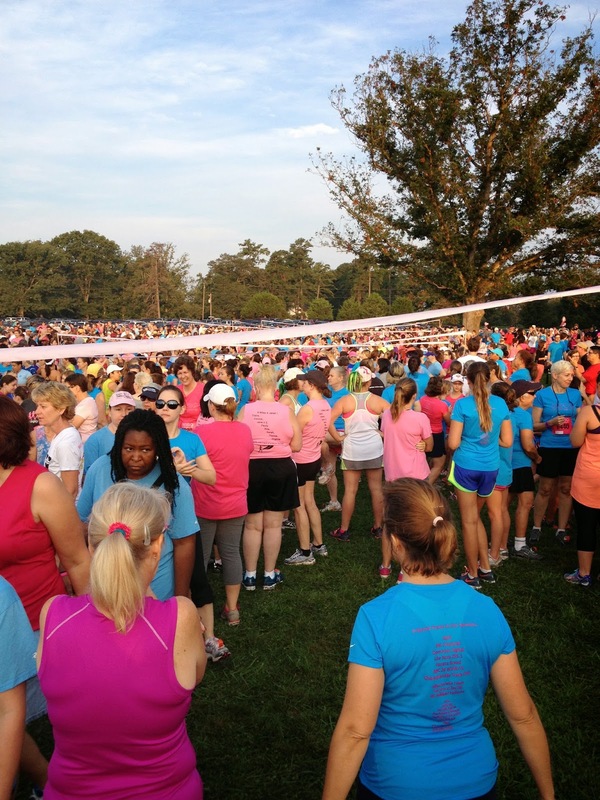 DO NOT forget to use the bathroom just before you enter your corral for the start line. If you have a long wait ahead of you, ahem Disney races, then wait as long as you can to go before you have to go in the corral. Other wise you will be like a lady in the Disney Race that has to go within the first 80 ft and uses her friends as a shield so she can go in the bushes off the side of the road. Or like my friend K who had to use the bathroom by the 1st mile. Stay hydrated but make sure you empty your bladder as close the the beginning of the race as possible. 4. DO NOT attempt to run in a race in something you have never run in before. You do all this training before a race and you learn what clothing works and how your shoes fit and you are comfortable. Don't mess with that mojo on race day and run in a tutu for the first time without ever trying it out before or a costume you have never worn around the house, or in BRAND NEW SHOES. You already know what works so stick with it, don't change the gameplay at the last minute because you could end up with chaffing, or blisters or a broken ankle. Stick with what you know works! 5. DO NOT forget to have fun. Soak in all the sights, sounds, and excitement that the beginning of a race and the feeling of running a race can give you. It is ok to get teary eyed when you cross the finish line of your first race, first 1/2 marathon or even if it is your 20th race. YOU ACCOMPLISHED SOMETHING that many people think is the impossible! It isn't and you showed that if you could do it, they can! We need to work together to end this obesity epidemic. It is out of control in our country. YOU KNOW IT IS and that is why you took this first step to sign up for a race, train for it and FINISH IT! You are amazing and so awesome! ENJOY YOUR RACE!